Fifteen people have been arrested after reports of Bank Holiday weekend disorder in Sunderland and South Tyneside. 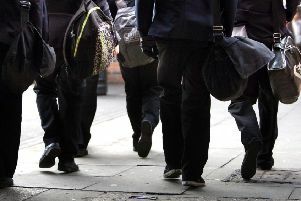 Over the Easter Weekend police issued a warning to youngsters after reports of anti-social behaviour in the South Shields and Wearmouth Bridge areas. There had been reports of large groups intimidating members of the public and causing criminal damage. Police have confirmed that 15 male youths have been arrested. Some of the teenagers have already been charged with criminal damage and public order offence while others have been referred to the local youth offending team. Supt Steve Heatley said: "We have been carrying out a number of enquiries to identify those involved in disorder and hold them accountable for their actions. "The disorder and anti-social behaviour has had a big impact on the local community and caused a lot of distress to local residents. "The arrests we have made this week should send a strong message out to those who don’t respect our local communities. "Our partners at the British Transport Police and Nexus have been crucial to making these arrests and ensuring this collaborative operation was a success." Anyone who has any information or would like to report anti-social behaviour should contact Northumbria Police on the non-emergency number 101.